Mackenzie believes there is power in being a great listener and thinks thorough research is essential for creative success. She makes it her goal to build long-lasting relationships with everyone she comes across. Mackenzie is a Lexington native who made her way back after four years down in sweet home Alabama. 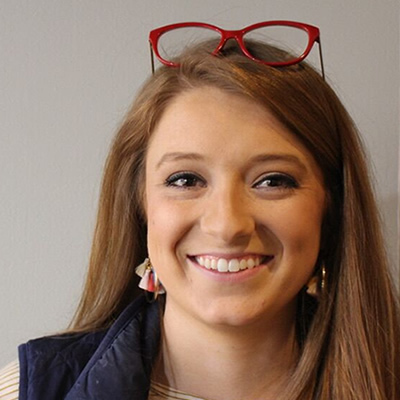 A recent graduate of Auburn University, Mackenzie studied public relations and marketing. As a PR student, Mackenzie was a public affairs intern for the US Army Cadet Command at Fort Knox where she managed social media, practiced photojournalism and learned about videography. The thing Mackenzie likes most about PR is the way it combines tactical business strategy with innovative creativity. She believes hard work, reliable communication and a good checklist are all necessary to produce the best quality of work. I loved the idea of shining a light on passionate people and their work. This field gives me the opportunity to meet hardworking people from all kinds of industries and highlight their craft. I admire people who go out of their way to make everybody feel like a somebody. I’m most proud when I dive head first into a task learn a new skill that can benefit our clients. Most recently it’s been learning everything there is to know about podcast production, editing and distribution. What latest development in marketing has you the most excited? I love watching trends in artificial intelligence (AI) and what it means for marketing. Its already providing incredible opportunities for more creative campaigns and better data, and this is just the beginning! I can usually be found trying new restaurants around Lexington, attending every Auburn University sporting event I can, or cheering the loudest at my little brothers’ football and basketball games.